Take a walk in Bali and you'll soon find yourself stepping around the colourful Balinese offerings laid out on nearly every street. These tiny handmade baskets, known as canang sari, are filled with flowers and topped with a stick of incense. They are freshly prepared on a daily basis and carefully positioned around temples, homes and pavements all over the island. 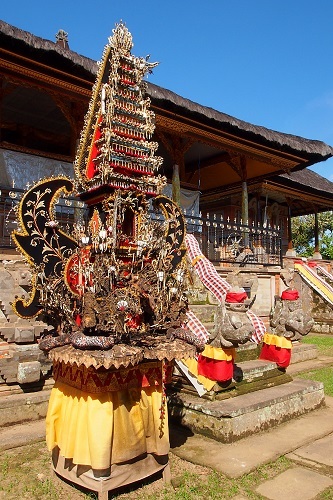 For the locals, they represent a sacrifice of time and energy to the gods that protect the Balinese people. For visitors, these daily offerings are a photogenic curiosity. They are also a source of bewilderment as everyone tries to negotiate them without causing offence. Although not as common as canang sari, we came across offerings of pig meat and entrails as well. 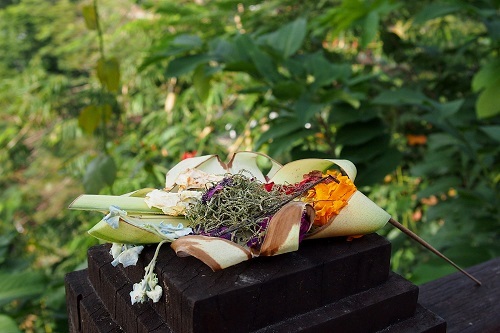 The Balinese make these more sinister offerings to appease the Hindu demons in the hope that they will not bother the living. The basis of a canang sari is a palm leaf basket filled with a selection of flowers. The colours of the flowers represent various gods and even the orientation of the basket's corners is significant. North: Blue flower petals and shredded betel leaves represent Vishnu, the protector to the north. South: Betel nut and red flowers represent Brahma, the fiery creator to the south. East: White flower petals symbolising Iswara occupy the Eastern corner. 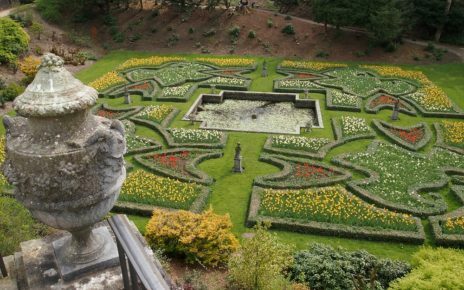 West: Yellow flowers to the west are dedicated to Mahadeva. In the centre, lime signifies the supremacy of Shiva, the destroyer of evil and transformer of the universe. The next step is to add a small sacrifice to the canang sari, often a portion of rice, crackers or sweets. 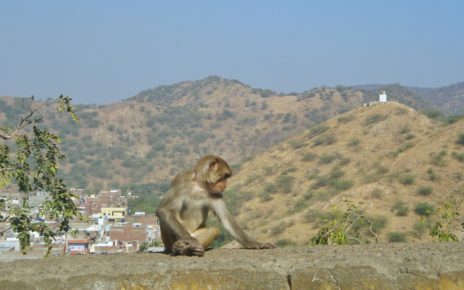 The local monkeys are particularly fond of this tradition. We frequently saw them rummaging through the offerings in search of a tasty snack. Like the rest of the canang sari components, food is biodegradable. It's easy to dispose of this kind of offering at the end of the day, safe in the knowledge that nature will eventually return to nature. Some people add small amounts of money or old fashioned brass coins to their offerings instead of food. Although these traditional Chinese style coins, known as kepeng, have no monetary value they are still used for ceremonial purposes. We saw offerings with real money on the dashboard of taxis. Offerings left in the street however, were usually topped with food. To complete the offering, the maker adds a stick of incense. Once lit, the burning incense carries the divine spirit of the offering to heaven. This is a crucial part of the process. It's important not to disturb or walk over an offering at this time. Once the incense has finished burning, the canang sari is spent. This earthly object can then be walked on, moved or disposed of at leisure. 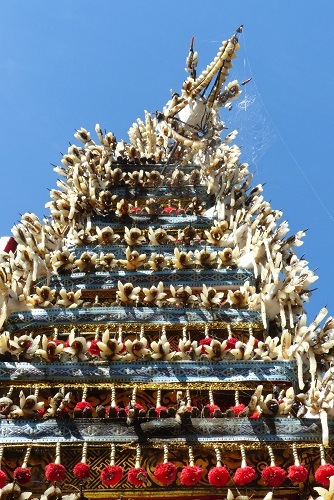 A towering black pyramid painstakingly decorated with the head and skin of a dead pig was by far the most elaborate offering we saw in Bali. The fatty pork rind had been carefully sliced, arranged into artistic spirals and skewered, giving the appearance of decorative candles. The pyramid bristled with hundreds of these 'candles' interspersed with red pom poms. The pig's head was the centrepiece of the offering. It had red pom poms for eyes and a crudely carved piece of pig skin in place of a tongue. Despite sitting out in the blazing sunshine, the smell was not as pungent as you might expect. 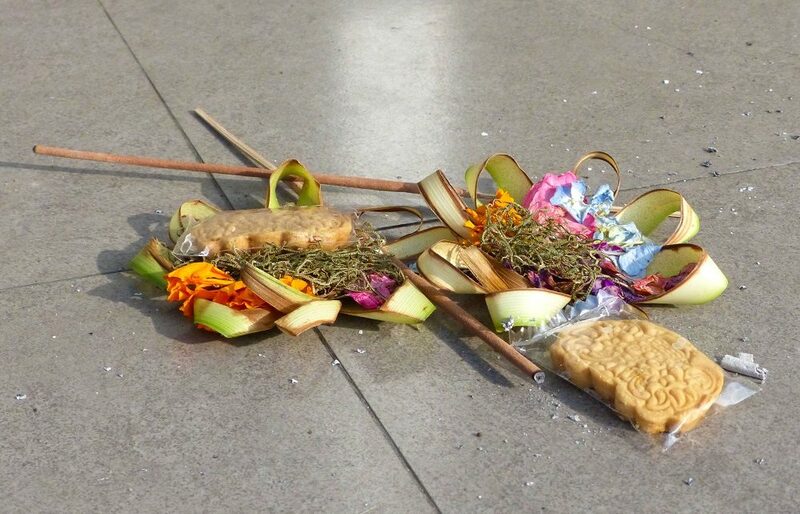 These unusual offerings are for Hindu demons who may otherwise bring harm and misfortune to the good people of Bali. The Balinese hope the offerings will distract the demons and keep them away from human affairs, something like a celestial protection racket. These demonic offerings are often made from the remains of a hog roast. They feature at weddings and other large celebrations that traditionally involve feasting on roast pork. Offerings to the gods may be placed on or in temple buildings. Demonic offerings however are intentionally kept outside these holy places. 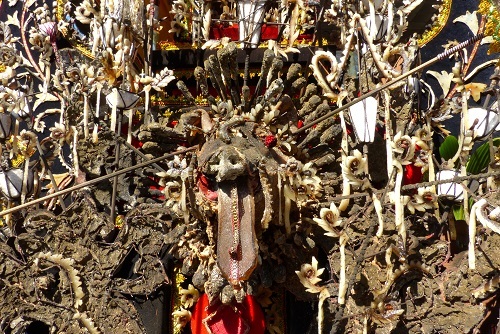 We found our gruesome pork offering in Pura Penataran Sasih temple in Pejeng. It stood a short distance from the main temple building. Balinese women can spend an hour or more every day painstakingly preparing offerings to the gods. Men are rarely involved in the process. The meat based offerings to the demons however are almost exclusively made by men. These are usually reserved for special occasions. Balinese culture has deep religious roots that influence the daily lives of the local people. It was surprising how often the Balinese people we spoke to referred to God. Even when commenting on the unfavourable weather in our home country, we were advised to take it up with God. Despite having smart phones, Wifi and all the other trimmings of modern life, spiritual traditions including daily offerings are still alive and well in Bali. Canang sari are active while the incense is burning so be careful to walk around them during this time. Stepping over them will disrupt the process and is just as bad as trampling on them. 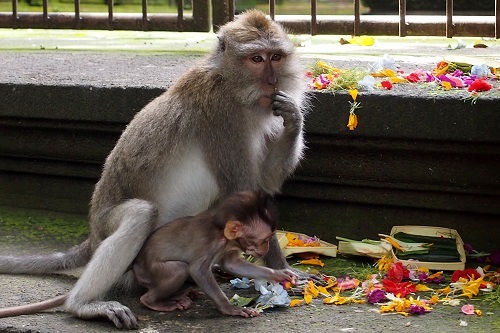 Don't contribute your own money or coins to a Balinese offering, they are not donation boxes. 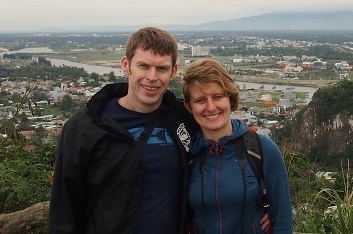 Hi Howell, The first time we went to Bali we were much the same – just trying not to trip over the offerings. The second time we learned a lot more about them and came across the pig offering. The pig fat was so beautifully carved that it took us a while to work out what it was made from.